Barren mountain flanks; meandering glacial rivers passing through verdant valleys; cloud swirling around snow-capped peaks; whitewashed Buddhist monasteries and fluttering prayer flags. The landscape here is so staggeringly beautiful that filming is almost only a matter of putting a camera on a tripod and pressing the record button. I spent the first few days loving the task of capturing landscape GVs. That was the easy part. The climb was yet to begin. 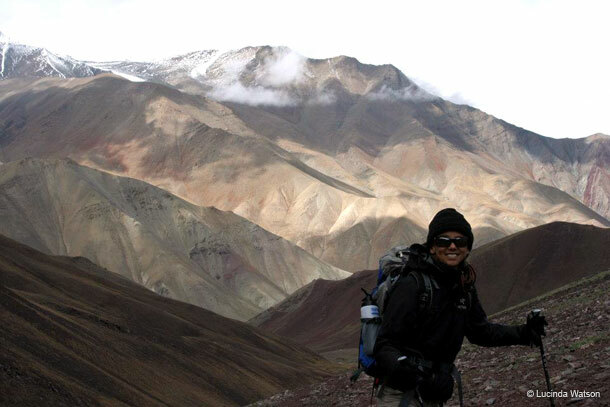 I was joining a group of six women up a mountain called Gulap Kangri, 5,960m above sea level. The night before we headed to the trailhead I fully charged all the batteries and clad the camera in its insulated jacket. The temperatures were set to fall dramatically on our ascent which would bleed power from the batteries. But those first couple days the weather was fair and I took the opportunity to do a few pieces-to-camera and interviews (although only the female trekking guide Rinchen Dolma’s bites made the final cut). Weather conditions were set to deteriorate markedly. When the guide woke our group in the early hours of summit day there was a foot of snow on the ground. Three of the six women did not feel well enough to leave base camp. 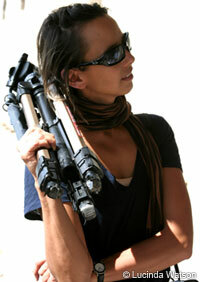 The other three women, four guides and myself ate a heavy breakfast, geared up and set off. Climbs are always tricky to film because of the unpredictable variables: the weather, the group, my own well-being and the hardiness of the camera equipment. Each individual in the group was progressing at a very different pace and I swiftly realised I could not pull out my camera without disrupting our collective rhythm. After dawn one of the group asked to turn back; shortly afterwards another followed her down. Even with the reduced size of the group -- now only three guides and one fellow climber Lucinda -- it was not appropriate to request a stop to film. I knew I was destined to have a challenge building a package without footage of the final ascent… but I also knew the key shots -- at the summit -- were yet to come. Fortunately -- and triumphantly -- this final group made it to the top. Conditions were dreadful and there was no view; one of the guides told me that on a clear day I would be able to see K2. I groaned. As we descended the weather cleared and I was able to capture footage of Leh, the Indus Valley and distant mountain peaks. With the improving visibility I almost wanted to turn around and head up again to see the views from the summit that I had only imagined. At the same moment I vowed to return to this region.